Play Reel Rush Slot Online with 500 Free Spins! Reel Rush is a 5 reel blockbuster online slot game by NetEnt. This game is famous for its winning respin feature which awards 8 free spins after the 5th winning respin. Reel Rush RTP is 97%. Reel Rush on mobile comes with autoplay so you can set the reels rolling with an interruption for a chosen number of times using the "Autoplay" feature. This game comes with free spins, wild symbols re-spins and many more that makes it an enticing slot game. The icons of this game are represented by fruit symbols of different colours including green, purple, red and orange. Reel Rush has a minimum and maximum bet per spin at 0.50 and 50 respectively. Before you start to turn the reels, the bet level has to be adjusted with the “COIN VALUE” selector. There is the “MAX BET” which the player can use to select the maximum bet per spin. You can use the + and – arrows to increase and decrease the bet values. The wild symbols of this game can appear on reels 2 and 5 to substitute other symbols and form a winning combination and it substitutes all symbols. Each win triggers a free re-spin and 8 free spins are won if the fifth re-spin triggers a winning combination. Each stage of re-spin offers a number of ways to win. Starting from the first re-spin which offers 45 ways to win, one will reach 3125 ways to win at the free spin features. 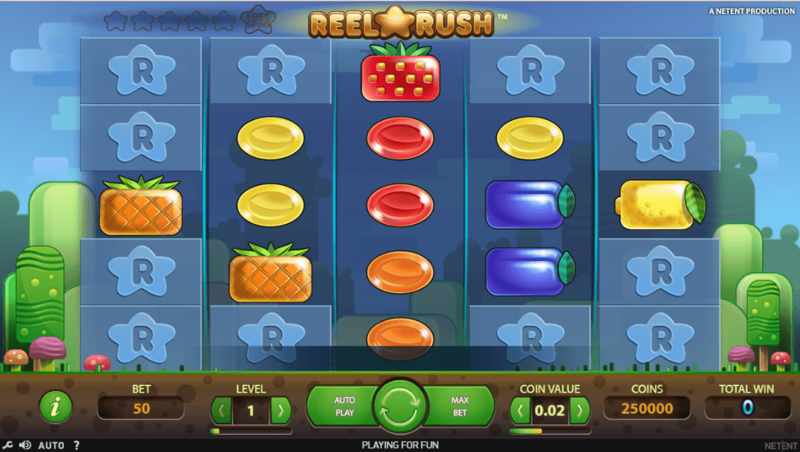 Reel Rush is a colourful slot game produced by Net Entertainment Software (NetEnt). Netent is known for producing some of the very best slot games including Starburst Online Slot and Gonzo's Quest and you can play this game online now at one of the very best Reel Rush casino sites - Rose Slots.